Sadly, one could make a case that the Bucs have a cornerbacks crisis. Joe still shakes at night when thinking about the Bucs not addressing cornerback in free agency while simultaneously announcing the first cornerback they chose in last year’s draft, M.J. Stewart at No. 53 overall, will now move to safety. And Bucco Bruce Arians said at the NFL Owners Meetings that the Bucs still need to identify a nickel cornerback. Yeah, yeah, Carlton Davis. Yeah, yeah, Vernon Hargreaves. They have an awful lot to prove. Another quality cornerback tossed into the mix would be a great move. Enter the NFL Draft. This year’s edition has a healthy crop of corners. Scoring Deandre Baker in Round 2 would get Joe doing some enthusiastic head-nodding. It’s a need whether or not fans want to accept it. Hall of Fame GM Bill Polian was talking about Baker recently. Polian said Baker’s 4.5 speed in the 40-yard dash is “borderline” but 5-foot-11 Baker has other traits that are excellent. For Bucs fans wondering, Hargreaves and Davis also ran 4.5 as draft hopefuls. Will Baker be great? Polian doesn’t think so because his speed will hold him back, but Polian does believe Baker will be a very good player out of Round 2. All kinds of beer specials flowing!!!! 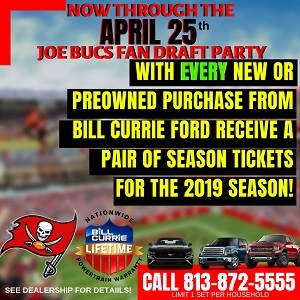 $3.00 shots, too, and all kinds of Bucs passion! OG please…….can we continue to ignore our Oline? i like baker but his best position in the nfl is safety imo…. if we’re going to draft a CB, get lonnie johnson….he may go mid 2nd early 3rd round tho….. The “crisis” is that the GM makes dumb pick after dumb pick after dumb pick. Illiterate running backs. Slow defensive backs. A tight end they didn’t need who is hurt every year. The Bucs haven’t had a decent draft since Lovie Smith was around. imo, first 3 rounds have to go to the trenches…..i would love an OG in the 2nd round….. I have to make sure I understand YOUR priorities Joe. Priority #1 is a DE (in spite of having JPP, Nassib, Barrett, Gholston & Spence). Priority #2 is now a CB so we can pair him with Davis (partial year experience) and VHIII (a goner next year?). Meanwhile back at the ranch, we would’ve released a starting DT (GMC), have no MLBs to speak of, and probably be starting TWO relatively inexperienced safeties. We won’t talk about ZERO running attack if Barber goes down or about our current RG turnstiles will probably get Jameis beaten up. Nah, DE & CB top priorities make perfect sense … in Mayberry RFD perhaps. Actually, in Bucsville it just might make sense. Scary. until that bum at RT is replaced it does not matter who you put at RG it’s a waste of time…. the entire right side of the line needs replacing if dotson starts one single game next year this team will be in a world of hurt as usual. (in spite of having JPP, Nassib, Barrett, Gholston & Spence). JPP: may be cut next year. Contract expires after 2020 season. He’s 30. Nassib: Why are people trying to make this guy out to be the next Lyle Alzado? The Bucs didn’t even like him coming out in the draft. Only reason he was signed is because the Bucs were desperate. He was CUT by the worst team in the NFL. Please. At best this guy might be Adrian Clayborn. Stop it! Do you actually think any defensive coordinator losses sleep over Carl Nassib? Barrett: Let’s see him produce first, shall we? Spence: Unless he has a complete and total unexpected turnaround, he’s gone after this year. The only prototypical 3-4 OLB/DE on that entire list is Barett. JPP is not going to be dropping into coverage for example the way Barett could. No way Will Gholston is going to be playing LB in this scheme either IMO. ILB=Lavonte David (Proven) + Buccannon (experienced in this scheme/staff) + Minter (experienced in this scheme/staff). Then if Beckwith or Cichy is healthy that’s 1-2 developmental players behind 3 capable starters. 3-4 OLB: Shaq Barret/ Noah Spence in terms of actual 3-4 OLB body types. Spence being a complete question mark. Nassib should rush well but not sure about coverage. In the end tho man I’m not Todd Bowles and maybe he has a wildly different plan for the front 7 than I’m imagining. Either way for years I have wanted an elite front 7 built before investing in drafted CBs. We should have been drafting front 7 and using vet CBs instead of drafting small corners and using vet older front 7 players. No rookie CB is going to develop into anything special if they have to stay in coverage 5-6 seconds on average. lmao that’s fine man I am not advocating for him as anything more than a proven starter relative to our 3-4 OLB situation. Making an all pro in your career is kind of hard to fluke tho man. Those awards are not popularity contests. He hasn’t been on that level in a bit but we’ve also seen every defensive player basically regress under the last 2 staffs. Lavonte does get a pass from the fan base way more than GMC; simply because he doesn’t like doing interviews. Did you throw Warren Sapp under the bus because he had a slow Rookie season or John Lynch for taking 2-3 seasons, or Ronde for having a bad Rookie year. At least give Carlton Davis , MJ Stewart and even Hargraves some latitude for the $hitty schemes and coaching that seems to have plagued the secondary for 5 seasons now. Lord C … I totally agree with you that Barrett is the only prototypical 3-4 DE in the bunch (although since Spence definitely isn’t a 4-3 DE he’d better come on fast as a 3-4 DE if he expects to make the team). And Nassib isn’t the slouch that Joe seems to think he is … in 598 snaps on defense (57%) he got 6.5 sacks, 14 QB Hits, 12 TFLs, 2 forced fumbles & 2 PDs. That’s not that shabby for a part-time DE making what, $2 mil a year? But alas, I’m sure it’s just another fluke. And oh ya, JPP ‘ain’t goin noplace’ … unless he screws the pooch OR decides he can’t take it anymore. He’s got several productive years left in him & the Bucs would be dumb as a turnip to let him go. Where we seem to maybe disagree a little is that I don’t see Todd Bowles running a pure 3-4 defense. From what I’ve read, it seems that he prefers a ‘hybrid defense’ that morphs from a 3-4 to 4-3 to WHATEVER as situations dictate. I’ve heard Joe whine for at least 2 years now that Smitty didn’t adapt his defense to his players (square pegs into round holes?). Well, Todd Bowles (supposedly) has a reputation of adapting his defense to fit his players talents. Obviously players still have to have TALENT, but they don’t necessarily have to all be 3-4 clones. As long as Bowles has some decent talent to work with, I think we’ll see improvements in our defense this year. As it stands right now though, Jason Licht has tied both hands behind his back. The center of this Bucs defense … today … would be extremely vulnerable. Not to mention that the whole defense lacks LEADERSHIP. Only time will tell though. Only time will tell huh. (BTW, I have my doubts that Spence will make the team, but Will Gholston could very well surprise a lot of people in a 3-4 hybrid defense. And don’t forget all those times over the years that he’s had to play in the middle (although undersized for that role) because our DTs kept getting trashed. Doubt seriously that Barrett or Spence or any of the lighter DEs could’ve done what he did). personal awards when your team permanently resides in the basement are meaningless. LC way to milk a one time all pro label from 2013… like i said lvd has not played consistently since his ONE meaningless all pro season back in 2013…. basement dwellers don’t deserve awards. Second round seems early for a player your expert already feels won’t be great, is small , slow and a finished product. How about talking about some players that can be had later in the draft with some upside and at least the hopes of being great. Props to the Mayberry RFD reference. You just don’t see that one everyday. I think the best CB in the draft may be Trayvon Mullen from Clemson. The only knock on hum is that the announcers never called his name. He was on his own island at the highest levels of college football and nobody would throw the ball in his direction. He was MVP in the national championship game vs Alabama with 6 tackles, 1 sack and 1 interception. He ran a 4.46 at the combine. Measured 6’1″ and 200 Lbs. He sported the #1 jersey for a pretty good Clemson team, they don’t just hand those out to scrubs. I still can’t believe we selected MJ Stewart at #56 last year with Donte Jackson on the board. I’m with you Pickgrin. Taking Stewart with Donte Jackson on the board was asinine. 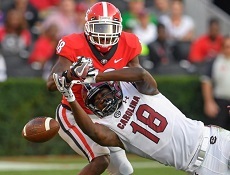 Defense Rules- Gholston should not be on this roster…..PERIOD! He has proven absolutely ZERO in 6 years and frankly, I cannot for the life of me figure out how he has managed to remain! Of all the players that SHOULD be replaced, he is numero uno! He got paid $6.5 million to do absolutely nothing in 2018. He’s due $3.75 this year. We could replace his stats with a cereal box wrapped in duct tape! 47 TACKLES AND 1 SACK T-O-T-A-L! That’s right for 17 and 18 combined! It’s the biggest head-shaker of all time! I thought we gave that up to dump GMC to Arizona and “trade up” to draft Williams? Now do you see why doing so would be a dumb-a$$ idea?! Good points on the hybrid look, and in the end basically I agree – this just comes down to how Bowles plans on attacking. In terms of Licht / the talent I agree it’s deficient for sure. I just don’t know how deficient it is because of how bad I believe the defensive coaching has been. We’ve seen Lovie has not gone onto bigger & better things. He’s been an massive failure at Illinois. I think Davis and VHG3 will be successful and it’s like you said Joe between Carlton and MJ you needed to hit on one of those prospects thus far it’s Carlton. I’m just really excited to see the new coaching staff the biggest staff in the NFL get these men prepared like never before. A smarter disciplined team and we can win a lot more games. @LC … “We also know that the coaching staffs have had heavy influence on the draft & FA”. Agree with you on that LC, but every time someone brings up how poor our coaching staffs have been, my first thought is “And who the blankety-blank SELECTED these coaching staffs?” The players certainly didn’t select them. Personally LC I feel the same way about our GMs. Losing is the result of BAD DECISIONS. And those bad decisions always start AT THE TOP. I remember the Patriots from years ago when they were BAD. Things turned around when Kraft bought the team in 1994 (for an incredible $172 mil … in 25 years they’ve now won SIX Super Bowls & the Pats are now worth a whopping $3.7 billion). He hired Belicheck in 2000 (after Belicheck had 4 out of 5 losing seasons as the Browns HC) and the rest is history … 225 wins, 79 losses in 19 years. And yes, Tom Brady’s been his QB since 2000 when he took over for Drew Bledsoe. It all starts AT THE TOP. Bucsfanman … If a given player is overpaid, don’t blame the player. Blame the person who overpaid him for being a terrible steward of ownership’s money & for being a poor judge of TALENT, POTENTIAL & PERFORMANCE. Hmmm, who would that be? Still, Will Gholston’s been asked to do things that he wasn’t really qualified to be doing, like playing DT (and he’s been used in that role quite a bit). He’s not quick enough to fool anyone, nor fast enough to just run around them or big/strong enough to just bull his way through. He is who he is … quite good at sealing the edge & stopping the run (and that’s pretty much it). But ya know, in 2015 & 2016 he led the DLine in solo tackles. Maybe it was how he was used in 2017 & 2018 that resulted in such seemingly poor play? I still have zero issues with the Bucs trading down a few spots, hopefully taking full advantage of a team that needs a QB who wants in front of the Giants. I mean really really take advantage of them, meaning multiple 1sts, a 2nd and maybe a 3rd. If they do that then get the best available corner, in the 2nd get another corner, with another 2nd get a LB or OG, then with your third get get either a LB or OG depending on what you did earlier, then in the 4th use that Licht magic to get another LB. You’d walk away from the draft with your #1 corner, hopefully a #3 corner in case VH3 is injured (and it’s his last year on his contract in any case), hopefully two starting LBs, and your starting OG. Yeah, it’s risky to beat on rookies to start, but what choice do the Bucs have at this point. I get it, that yes, you could bet on a d-lineman to be good in 2 years, and you got about a 25% chance of them not busting – but if you want/need to win now, you MUST walk away from the draft with guys who can play major roles right now – and you should never ever expect a rookie d-lineman to do much of anything. Defense Rules- How dare you attempt to bring levity to my reckless rantings! You are 100% correct though. This is why I scratch my head every time I see Jason Licht’s name associated with this team. Doesn’t change my opinion though! LOL! Depending on how the draft goes and if there hapoens to be a run on CBs in the 2nd round, I would either trade up into the end of the 2nd round or hopefully stay at our pick in the 3rd, and draft Joejuan Williams out of Vandy. He is the prototypical Todd Bowles corner and can cover his side of the field. Put Carlton and Joejuan on the outside and VH3 in the nickle and watch out. I’m hoping for Ed Oliver in the 1st, Chris Lindstrom in the 2nd, and Joejuan in the 3rd. Thats 3 day one starters and hopefully Licht can work his magic and get us and extra 2nd and/or 3rd. This draft is loaded with talent in the 2nd and 3rd rounds.